Mutations can be achieved naturally and by breeding. It is often the case that new fox types and colors are created by occurring deviations of the standard colors, which can then be used for new breedings. 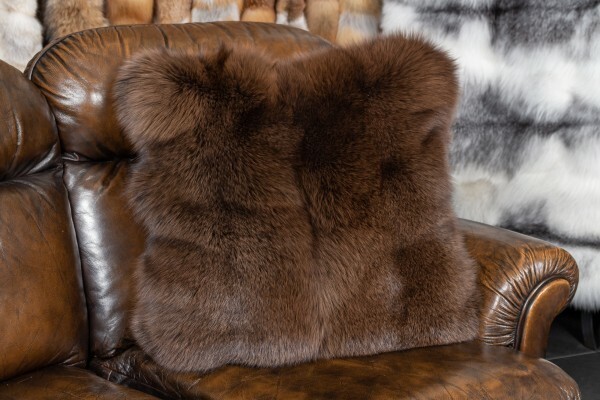 We at Lars Paustian - International Furs purchase exclusively high-quality Scandinavian and North American fox skins from the world-renowned fur-auctions SAGA Fur, Kopenhagen Fur and NAFA. If you have any questions regarding our fox fur blankets, please do not hesitate to contact us. Related links to "Arctic Frost Fox Pillow in Maroon"
Customer reviews for "Arctic Frost Fox Pillow in Maroon"